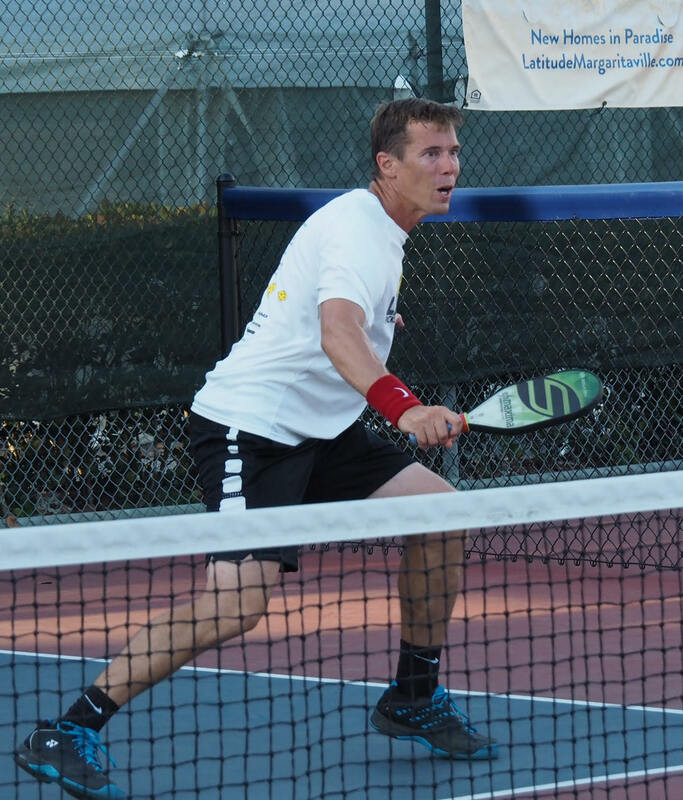 ST. GEORGE — Professional pickleball player and St. George resident Rob Davidson recently won two regional tournaments, one in northern Utah and one in Pennsylvania. In late May, Davidson, 40, captured gold in the men’s singles open division of the USA Pickleball Association-sanctioned Brigham City Memorial Day Pickleball Tournament. 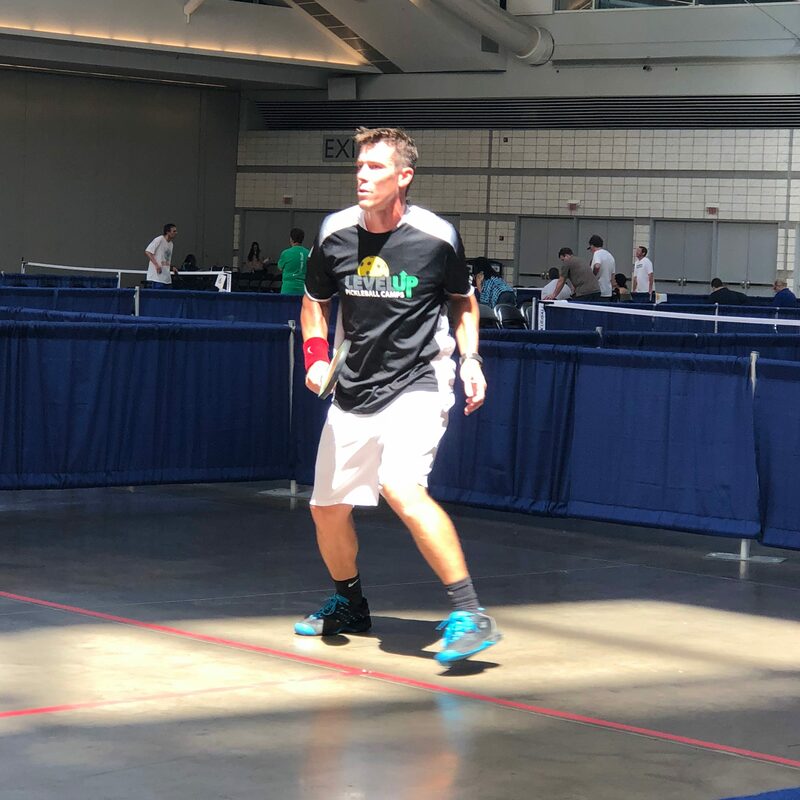 Then, the last weekend of June, Davidson won the men’s singles open division at the 2018 Gamma Pickleball Classic held in Pittsburgh, Pennsylvania, defeating Eden Lica of New York in the finals match Sunday, July 1. Davidson’s wife Shonda won the bronze medal in her singles division at Pittsburgh and teamed up with Rob to place fourth in mixed doubles. 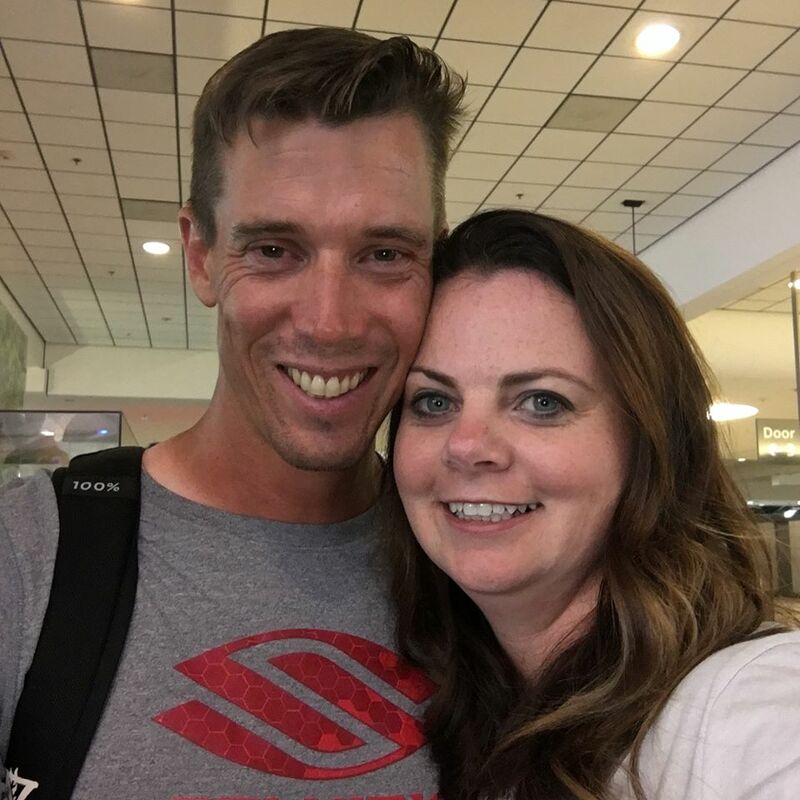 The couple, who first met each other on a pickleball court, now travel around the country playing and teaching the sport to others. Pickleball is often described as a cross between ping pong and tennis. Players use large paddles to hit a plastic whiffle-type ball back and forth over a net, with a scoring system similar to those used in tennis, ping pong, badminton or volleyball. Davidson says pickleball is one of the fastest growing sports in the United States, with 3 million participants and counting. Davidson, a lifelong tennis player since the age of 10, said he didn’t start playing pickleball until mid-2014. Within a year, he said, he’d switched over entirely, giving up tennis for pickleball. He’s now one of the top-ranked pickleball players in the country. Davidson said the Brigham City event, although similar in format to the Fall Brawl and the West Regional tournaments held in St. George, does have a differing aspect in that prize money is awarded to the top winners. Davidson earned $300 for winning the Brigham City tournament and $400 for winning the Pittsburgh tournament, which attracted some 600 players, mostly from the eastern United States. Davidson explained his connection to the Gamma Pickleball Classic, now in its third year. 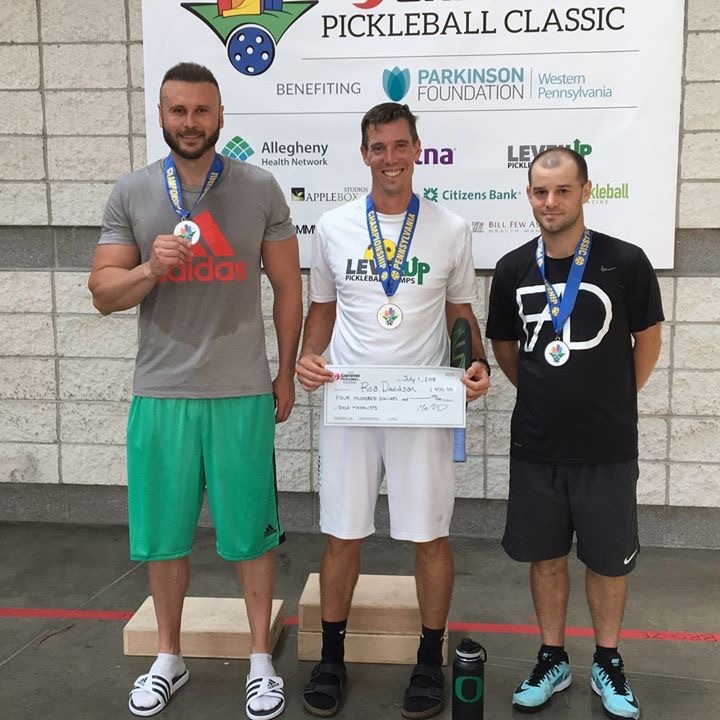 “I work for Pickleball Magazine doing camps called LevelUP Pickleball Camps, and the owner of the magazine lives in Pittsburgh, so I do a couple camps before this tournament and then play doubles with him,” Davidson said, adding that the tournament is a charity fundraiser for the Parkinson Foundation of Western Pennsylvania. The tournament was played on the polished concrete courts of Pittsburgh’s David L. Lawrence Convention Center, using indoor balls made by Gamma, the main sponsor of the tournament. Individually, Davidson uses and promotes Selkirk Sports’ paddles and accessories. A link to a video of the full 49-minute finals match between Davidson and Lica was posted on Facebook. Davidson said he found the shiny concrete surface interesting to play on. “Right now, the sport of pickleball is really still in its early stages of development as far as competitions go, and there is not really an accepted standard for which ball is to be used or which court surface,” he said, noting wood and hard tennis court surfaces are the two most common types, but that various other court surfaces are sometimes used, including concrete, asphalt and even indoor carpet. Davidson said the St. George community is fortunate to have its own 24-court complex devoted specifically to pickleball, namely the Little Valley Pickleball Complex located at The Fields at Little Valley. In addition to year-round pickleball leagues, St. George also hosts a major round-robin tournament at the SunRiver community in September, the Fall Brawl tournament and the Huntsman World Senior Games in October, plus city tournaments in the early spring, among other events. Click here for St. George City Recreation’s pickleball web page. Davidson said as he and his wife travel around the country promoting pickleball, they often encounter two obstacles or “bottlenecks” that they believe may be hindering pickleball from being more readily accepted as a popular sport. With the increasing number of younger players entering the sport and more widespread media coverage of competitive events, Davidson said he believes the misconception that only seniors play pickleball will also be short-lived. “Despite those bottlenecks, the sport of pickleball is growing incredibly fast.” he said.